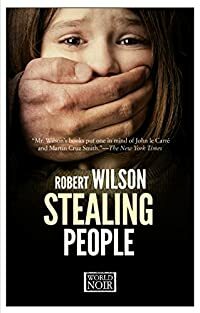 Stealing People by Robert Wilson: Synopsis and Online Purchase Options. Synopsis (from the publisher): Charlie Boxer, an expert at solving kidnappings, and his ex-wife Detective Mercy Dunqah are tasked with taking down a bold and heartless crime syndicate responsible for the abduction of six children. Two years after the events of the previous book in the series, Boxer is contemplating retirement. He has found a measure of contentment even as a mystery from his own past gnaws at his sense of justice. Mercy balances a complicated personal life with an even more precarious professional one in the woefully under-resourced metropolitan police department. Both are suddenly pulled back into service when six children of wealthy families vanish, taken by a ruthlessly efficient organization with a single astonishing demand. Investigators stymied and time expiring, they seem set on a calamitous course. Trapped, off-balance, and with little left to lose they plunge into a cauldron of warring intelligence agencies, morally destitute billionaires, and human traffickers, coming finally to a fateful Moroccan reckoning that will forever change them.